Surprise: 'We're expecting a baby! A couple of photos today is all I have time for. Too busy enjoying this exquisite post-deluge sunshine. 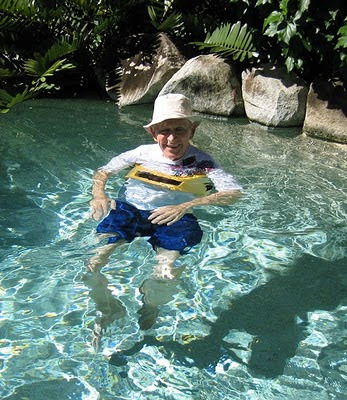 Allen and I have just come in from a long, luxurious swimming session. Allen's balance is poor at the best of times, even on dry land. So when standing chest-deep in water he can't manage even to stand upright unless he has the support of his flotation belt. But with it on, he's quite fearless and gets a lot of good exercise at every session. He used to be a good swimmer once, but swimming is another one of many abilities he has totally lost since his post-operative confinement. Funny what skills have deserted him. For example, he can no longer 'read' an analog clockface. He can recognise that it's time for the news, or nearly mealtime. But he just can't translate the clockface into words – doesn't recognise that the small hand on 10 and the big hand on 5 means 25 minutes past 10. And this is not because he can't find the words; he just doesn't 'read' clock-language any more. Solution: we bought him a digital watch. Problem solved. And here's another photo I took just a few days ago, when we had a very pleasurable day here with Allen's niece Helen and her husband Bill. 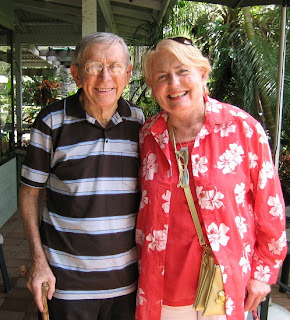 Helen and Bill were holidaying down on the Gold Coast and drove up to spend the day with us. Helen is one of two daughters of Allen's late sister, his only sibling, who was much older than him. They had good fun going through some of Allen's old scrapbooks. 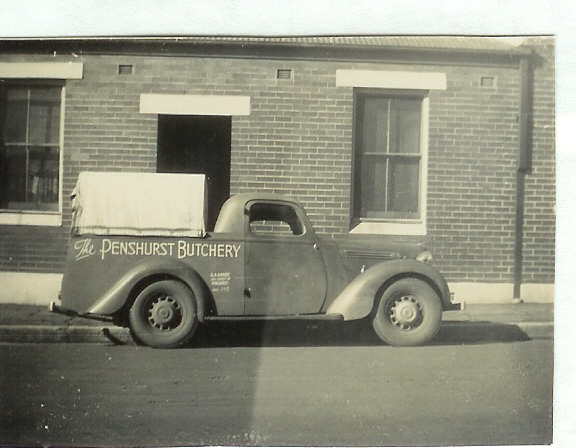 At one stage we heard a hoot coming from Allen's office, when Helen came across a photo of her grandfather's old ute. "We used to all go to the beach in that car when I was a kid", she said. 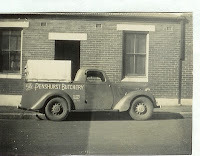 In those days no one worried about carrying a bunch of small kids in the back of a ute. It was a lovely, relaxed day. Bill and I cooked shish kebabs and marinated chicken on the BBQ. And just as we were about to serve blueberry pie, a couple of friends dropped in and joined the party. Allen, battling his own afflictions, and Helen, valiantly fighting MS for many years, obviously share the same gutsy and fun-loving genes. It's amazing how many problems can be solved with a little lateral thinking or something even simpler - like the use of digital rather than analogue. People with autism often have great difficulty reading clock faces. It seems Allen married some fun-loving genes too! (hugs to you both). Thanks to you both, my dear faithful readers. Such a good feeling to be 'connected' digitally.